Definition: A constructed wetland is an artificial wetland created for the purpose of treating anthropogenic discharge such as municipal or industrial wastewater, or storm water runoff. Constructed wetlands are engineered systems that use the natural functions of vegetation, soil, and organisms to treat different water sources. They can be designed to emulate the features of natural wetlands, acting as a bio filter to remove sediments and pollutants such as heavy metals from the water. Some constructed wetlands may also serve as a habitat for native and migratory wildlife. Constructed wetlands have grown in popularity over the last couple of years mainly because of their natural look and aesthetic appeal. One of the great things about wetland filtration is that there is no size limitation. The plants, rocks, and gravel act as biological filtration media, similar to what you see in nature. The key to a successful wetland filtration system lies with the plants. Plants are an integral part of any balanced ecosystem and help to create a natural and aesthetically pleasing environment. Plants help purify the water by reducing nutrients, filtering out sediments, and absorbing toxic compounds through the process of phytoremediation. They’re also the basis of a food web in which pathogens are consumed by microorganisms associated with the aquatic plants. 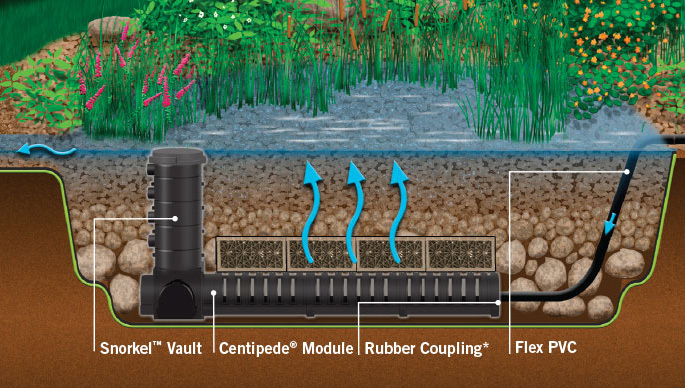 With today’s growing tendency toward creating sustainable and low maintenance landscape solutions, a constructed wetland filtration solution is an obvious choice.